I love packing up a picnic for lunch or dinner, and heading out to the park. It’s even fun to pack up the picnic basket and eat dinner at the backyard picnic table. I love it when I find new salads or summer side dishes that can be made ahead to marinate all morning, and then packed up for a picnic. 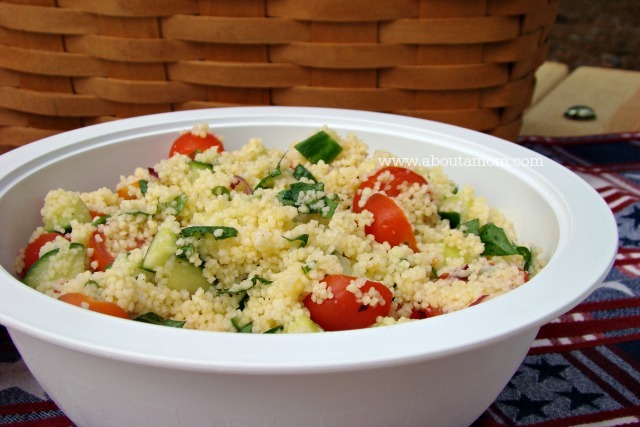 This picnic perfect Couscous Salad is one of those salads. It even tastes great if you whip it up and eat it right away. It’s also a great salad to bring to a potluck, pool party or neighbor’s BBQ. 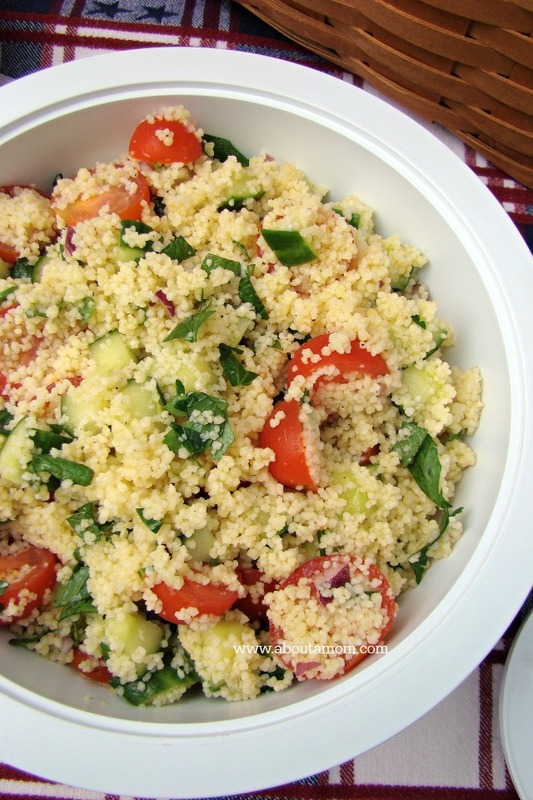 This couscous salad is full of summer flavor with cherry tomatoes, fresh mint an parsley. My garden is bursting with fresh herbs right now, so I love a recipe like this that uses them up. Cook the couscous according to package directions. 1 cup dry makes 1 1/2 cups cooked couscous. After the couscous is cooked, drain using a fine mesh strainer, and then rinse it immediately with cold water, and then drain well. The couscous will seem sticky straight from the pot, but no worries, it won’t be sticky after it’s rinsed and drained. In a large bowl, add 1/2 cup olive oil, chopped onion, and 2 tablespoons lemon juice, whisk until combined. Stir in the couscous, cucumber, tomatoes, parsley and mint. Add in a bit of salt and pepper to taste and toss to combine. Serve this salad right away or store covered in the refrigerator for later. If you prepare this salad the day before for an event, just omit the mint and parsley, cover and chill the salad, and then stir in the freshly chopped mint and parsley just before serving. Cook the couscous according to package directions. 1 cup dry makes 1 1/2 cups cooked couscous. After the couscous is cooked, drain using a fine mesh strainer, and then rinse it immediately with cold water, and then drain well. The couscous will seem sticky straight from the pot, but no worries, it won't be sticky after it's rinsed and drained. I have never had couscous before, this certainly looks delicious. I can’t wait to give this a try, thank you for sharing this recipe. Summer time salads are the best. I bet the lemon and mint in this one make for a fresh tasting salad. I’ve never made cous cous. I may have to give this a try. This looks awesome for a summer salad, I love all the fresh ingredients. Easy to make too! YUMMY! I’ve only made couscous once before. I liked the taste of it, but the texture takes some getting used to. Looks perfect. I love recipes that incorporate all the goodness of a summer harvest. Thanks for sharing. Oh, the mint sounds like a great addition to this salad! I’ve never made a couscous salad before! I have never even tried couscous before but I think I will have to try this salad, it looks and sounds delicious. I have never tried couscous in a salad, but it looks like a good recipe and a nice change from other salads. I’ve never made couscous before, but I really want to try this salad! I’ve never made Couscous before. This looks delicious and healthy. Thanks for sharing another recipe option I can try and make! I don’t like couscous but this looks delicious! Maybe I could learn to like it more! This looks like a nice twist on the normal summer recipe. Thank you for this idea. It looks really good. I love packing for a picnic too. We live close to a big park so occasionally we will have a picnic in the park with the kids. I have never tried couscous but I would love to try it. That would be perfect to take to my picnic this weekend. I’ve never had couscous but this looks really good. I have to make a couple of side dishes for a fourth of July celebration so I have been keeping my eye open for yummy recipes to try. what a great summer recipe. i would love to make this for a bbq. it is healthy and light and tastes amazing. Looks delish and healthy too. I’d imagine it work also work well if you used quinoa in place of couscous for those wanting an extra protein kick! I have never tried couscous. This recipe makes me want to give it a go! Looks like an awesome salad for the fourth. I will have to try and make this. Thanks for sharing. That looks delicious! My kids will eat couscous (they aren’t always the easiest to feed), so this would be a hit with the whole family. Looks delicious! I can’t do couscous because of a wheat allergy, but I bet I can do cauliflower “rice” and get the same texture. I’m totally going to try it! I’ve had couscous before but never in a salad. It sounds interesting! I will have to give this recipe a shot. My family will eat couscous, which is a shock. So I will see if they like it in a salad. Thanks for the recipe. What a great recipe! I am a summer salad fanatic and I love fresh mint–so this is definitely a recipe I will try and probably make all the time. Thank you for sharing. I’ve never cooked my own couscous before, but I may have to take the plunge! This looks too good to pass up! That looks delicious. I love couscous! I have been looking for recipes using couscous. This looks yummy as well as healthy. This delicious and seems very adaptable to what you have on hand. Very summery and easy for picnic or lunchboxes! I just had to come back & tell you that we tried this salad for one of our family’s 7/4 dishes. It was a hit! Yay! I’m so glad you enjoyed it. This looks like it will be pretty good. We made some couscous a few weeks ago, but it was plain and it wasn’t very good. It definitely needs to be mixed with something. We’ll have to give this one a try. Thanks for the recipe. This recipe looks interesting. I like the addition of fresh mint and lemon juice. I love couscous so much! I haven’t used it in a salad before; yum! This looks great. Thank you for sharing this with us. Looks delish! I love couscous so much. I eat it every week, so I’ll definitely be trying this recipe. This looks so good. I have never tried couscous before. But this salad sounds good and easy to make.